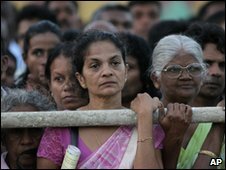 The Sri Lankan opposition coalition which contested the recent presidential poll has split after some parties said they were forming a new alliance. A group of smaller parties have said they are uniting without the biggest group, the United National Party (UNP). Senior opposition leader Vijitha Herath told the BBC that the coalition broke up after the UNP refused to contest the elections under a common symbol. Parliamentary polls are due to be held on 8 April. Analysts say the latest move is likely to strengthen President Mahinda Rajapaksa's coalition. The opposition coalition started to disintegrate soon after their candidate, Gen Sarath Fonseka, lost the presidential election by a huge margin last month. Mr Herath, who is a leader of the Janatha Vimukthi Peramuna (JVP) party, told the BBC that the new political front, the Democratic National Alliance, will contest the elections under the leadership of Gen Fonseka, who is in military custody. Gen Fonseka is accused of plotting to overthrow the government. But he denies the charges. The new coalition will contest the election under the symbol of a trophy. The UNP will contest the poll under the symbol of an elephant.